What comes to mind when you think of Montana? Magnificent mountain ranges and river valleys? An elk bugling at dawn on a brisk fall morning? Trout rising in a secret fishing hole? The wide-open spaces that give us room to breathe, inspiration, and peace of mind? How lucky are we to be here—in this spectacular place—this special place—this rare place? This region is the last intact temperate-zone ecosystem remaining on the planet. The last one that is virtually whole, essentially complete. Conservation biologists consider Montana’s iconic wildlife resource second only to that of the African plain, the Serengeti. Montana is special, indeed! But, will it remain so? There is a juggernaut headed our way. Bozeman has the dubious honor of being the fastest growing area of its size in the nation, projected to grow to the size of Salt Lake City by 2041. That’s only 23 years from now! Kalispell is close behind. That’s going to put a lot of pressure on this exceptional place. WSE strongly believes we must help our agricultural neighbors to stay on the land. They are the first line of defense if we are to protect the wide open spaces, environmental integrity, and cultural character of Montana. The choices they make about land stewardship and development will determine the future of the region. Fortunately, WSE’s two decades of experience has proved that outstanding stewardship and profitable operations go hand-in-hand. However, farmers and ranchers need information on the techniques that improve land health and reduce operating costs without compromising habitat or water quality. They also need lucrative markets offering reasonable prices for their products as a reward for their stewardship. WSE provides landowners with information about the latest “best practices” for land management and connects them to technical specialists who have pioneered, and most importantly, proven that these techniques can heal the land and boost the bottom line. We share this information one-on-one and through workshops and ranch tours so landowners can witness the benefits of the practices on the ground and meet the people who are making it work. We certify operations successfully using regenerative practices, then connect our certified producers to chefs, restaurants, institutions, and consumers interested in their quality products. Lastly, we foster positive connections by operating the Livingston Farmers Market as a way to connect farmers and ranchers directly to consumers and by introducing producers to markets through our Local Food Program. And now, WSE is facilitating something truly unique: rewarding ranchers for sequestering carbon. Our goal is to conserve another 150,000 acres within three years and 1 million within a decade. I’m delighted to tell you about WSE’s new groundbreaking program, our Montana Grasslands Carbon Initiative! WSE is partnering with an international carbon program developer, NativeEnergy, and our long-time collaborator, Xanterra Parks and Resorts, Yellowstone and Glacier National Park’s primary concessionaire, to launch this program. Because grasslands cover over 40 percent of the earth’s surface, scientists now believe they are even more important than rainforests for pulling dangerous carbon dioxide (CO2 ) from the atmosphere through photosynthesis and “sequestering” the carbon deep underground. The healthier the grasslands, the more CO2 is eliminated from our sky. Unfortunately, over 80 percent of the world’s grasslands are in poor to marginal condition. What if they were brought back to health? A growing number of scientists believe improving the health of half of the world’s grasslands could begin mitigating the impacts of climate change. 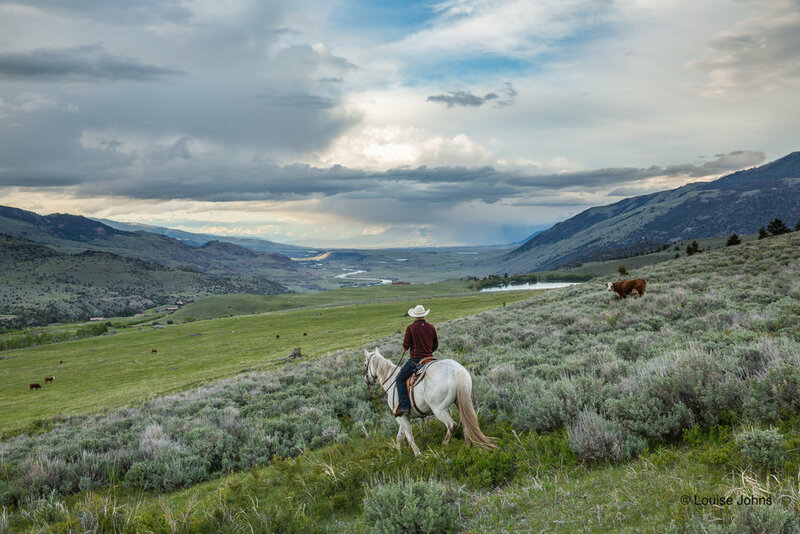 Our partnership is leveraging the resources many ranchers need to ensure healthy grasslands in Montana. We are providing information, technical assistance, and upfront monies to make critical changes in the way grasslands are grazed. We will then compensate landowners for their stewardship with carbon offset payments based on the amount of carbon they sequester each year. We will facilitate these payments through the sale of carbon offset credits to companies dedicated to reducing their carbon footprint, such as Xanterra. This is the first program of its kind and scale in the United States, second in the world only to one in Kenya. Taken together, the impact of our work includes over 1.45 million acres being managed with regenerative practices by over a thousand producers who have participated in our workshops, certification program, or other educational activities. These producers are supported by WSE’s network of 50 restaurants serving sustainably produced local cuisine, including restaurants in Yellowstone and Glacier National Parks. Our efforts are generating nearly $2 million in annual sales for producers in our programs, including almost a quarter-million local dollars moving through our Livingston Farmers Market in sales to vendors. Please take a moment to consider the magnitude of the impact you’ve helped us achieve. Think of how much more we can do together. WSE is poised to conserve millions of acres of open space and critical habitat by facilitating outstanding stewardship, but we need your support. Together we will ensure our wide open spaces, iconic wildlife, and agricultural heritage are preserved for future generations! It’s an exciting time—an important time—for WSE and the place we all love. Please give as generously as you are able. Please help us expand our impact by making your most generous contribution today. Your year-end gift will help WSE create a model that can be replicated throughout the West, and perhaps even the world! Just click here to donate.